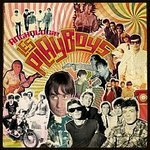 LES PLAYBOYS have been rocking the French Riviera since 1976 now (1979 being the year of their first release, the LP BOOTLEG on RAT RECORDS). The five members consider 1963-1966 the golden age of music, which is clearly recognisable in their own sound. Their albums alternate covers from British Beat heroes, such as THE SPENCER DAVIS GROUP or THE ROLLING STONES, American Garage, Surf etc., and their own compositions. They were part of the 80's Garagerock revival and have played on the most international Mod Weekenders, delivering amazing live shows to a large and enthusiastic crowd. Now they release a new LP on SOUNDFLAT RECORDS: ANTOLOGIE. The LP, which is also available as CD, contains a selection of some of the best pieces LES PLAYBOYS have to offer. Starting off with a brilliant Surf instrumental 'L'homme de tanger', the album carries off with authentic 60's Garage songs, presenting their French Yeye influence ('La radio l'a annonce'), wild surf guitars ('L'homme de Marrakech'), fuzz guitars ('Maudit') groovy organ sounds ('Elle n'aurait pas du') and a stirring beat with an occasional touch of harmonica ('1 heure que j'attends'). ANTOLOGIE is a smooth summary of their work between 1982 and 2008 and contains songs from their previous works LOUP-GAROU and UNE HEURE QUE J'ATTENDS (JUNGLE MEDIA), ALBUM BLANC (A.V. INCORPORATED), ENCORE (HIT RECORDS), LA BAIE DES REQUINS (DIG RECORDS), JE REVENDIQUE (FASCINATION RECORDS) and ABRACADABRANTESQUE (TEEN SOUND). It is a perfect overview of their work and ideal for newcomers to the band as much as for their longtime fans. ANTOLOGIE by LES PLAYBOYS delivers a highly authentic 60's sound and is just right for all wild, partying and dancing 60's MODs & rock'n'rollers! !